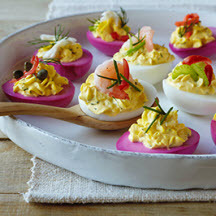 Make these gorgeous purple deviled eggs ahead of time for easy holiday entertaining — perfect for Easter brunch! Mix and match your toppings! The possibilities are endless – shrimp, chives, smoked salmon, crabmeat, capers, diced red bell pepper, Italian parsley, cucumber, fresh dill, etc. For Marinade: Drain beets, reserving juice (about 2/3 cup). Set beets aside for another use. Combine beet juice, water and vinegar. Arrange egg whites cut side down in shallow container. Pour beet mixture over eggs. Cover tightly. Refrigerate at least several hours or overnight, turning occasionally. Remove purple egg whites from beet mixture, pat dry with paper towels. Spoon 1 heaping tablespoon yolk mixture into each reserved egg white half. Garnish with toppers, as desired. Makes 20 deviled egg appetizer servings. To peel a hard-boiled egg: Gently tap egg on counter-top until shell is finely crackled all over. Roll egg between hands to loosen shell. Starting peeling at large end, holding egg under cold running water to help ease the shell off. Nutritional Information Per Serving (1/20 of recipe; 1 deviled egg appetizer): Calories: 61; Total Fat: 4 g; Cholesterol: 114 mg; Sodium: 121 mg; Carbohydrates: 2 g; Dietary Fiber: 0 g; Protein: 4 g; Vitamin A: 187.9 IU; Vitamin D: 25 IU; Folate: 14.7 mcg; Calcium: 20.3 mg; Iron: 0.5 mg; Choline: 89.1 mg.